Hillary Clinton, like most of America, isn’t laughing at Donald Trump anymore. 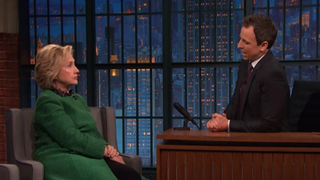 The Democratic presidential candidate appeared on NBC’s Late Night With Seth Meyers Thursday and said that before Trump’s proposed ban on Muslims entering the U.S., he was laughable, but that now the GOP presidential candidate has crossed the line. Trump’s anti-Muslim plan “plays into the hands of the terrorists. And I don’t say that lightly," Clinton added. “He is giving them a great propaganda tool, a way to recruit more folks from Europe and the United States. “And because it has kind of crossed that line, I think everybody, and especially the Republicans, needs to stand up and really say, ‘Enough, you have gone too far. That is not who we are. That is not the kind of country that we believe we are, and we are just not going to tolerate it,’” she said.